Catalytic pyrolysis of biomass could be a cost-competitive route for biofuels production. To achieve that, development of dedicated catalysts for selective deoxygenation and cracking of bio-oil would be essential. Such breakthrough catalysts could pave the way for scaling up the existing pyrolysis technologies to achieve commercial production of biofuels through pyrolysis. In this issue of Biofuel Research Journal, Dr. Ali Imran (University of Twente & King Abdullah University of Science & Technology) and his coauthrs take us through the details of various catalysts developed with unique properties for enhanced formation of desirable compounds by pyrolysis. They emphasize that the way forward is to develop more dedicated catalysts suitable for industrial scale operations. Cover art by BiofuelResJ. BRJ's June issue features outstanding biofuel research, and perspectives across the journal's broad scope. The issue highlights important fundamental research in genetic engineering in biofuel production, green diesel production, and anaerobic digestion and as well as research and perspectives in application of nanotechnology in the biofuel industry. 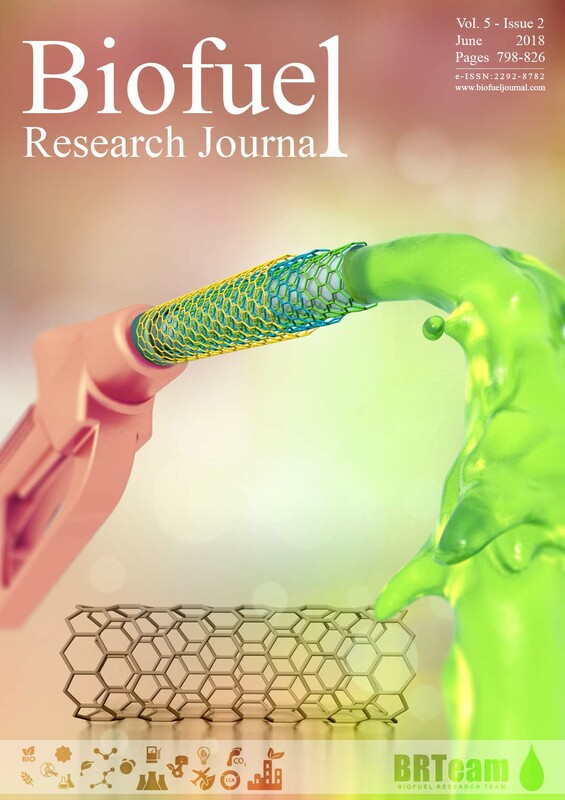 The editorial deals with the growing applications of nano-materials in different domains of the biofuel industry presenting successful examples of related applications. We hope you enjoy reading it. The biofuel industry is rapidly growing with a promising role in producing renewable energy and tackling climate change. Nanotechnology has tremendous potential to achieve cost-effective and process-efficient biofuel industry. In this issue of Biofuel Research Journal, Dr. Abdul-Sattar Nizami (Associate Editor of Renewable and Sustainable Energy Reviews) and Mohammad Rehan (pp. 798-799) take us through the details of various nano-materials developed with unique properties for enhanced biofuel production/utilization. They emphasize that the way forward is to develop nanotechnology-based biofuel systems at industrial scale. Cover art by BiofuelResJ. With a unique publication policy of Completely Free-of-Charge and Open Access at No-Charge, Biofuel Research Journal is indexed by Thomson Reuters Web of Science (also known as ISI Web of Science): Emerging Sources Citation Index, Scopus, CrossRef, DOAJ, EZB, CAB Abstracts, and CAS Databases (Chemical Abstracts). The strong and unique Editorial Board of BRJ includes Editor-in-Chiefs (EICs) and Editors of many prestigious high impact-factored journals in the field such as Biorsource Technology (EIC & Associate Editor), Water Research (EIC), Biotechnology Advances (Editor), Applied Energy (Editor), Desalination (EIC), Industrial Crops and Products (Advisory Board), Journal of Biomass to Biofuel (EIC), International Journal of Hydrogen Energy (Editor), BioEnergy Research Journal (Associate Editor), BioResources (EIC), Energy & Environmental Science (Advisory Board), MethodsX (EIC & Advisory Board), Journal of Membrane Science (Advisory Board), Chemical Engineering Science (Editor), Catalysis Today (Advisory Board), ACS Catalysis (Advisory Board), etc. The Editorial of the current Issue (Issue 16, 1st December 2017) entitled “Biofuels and green chemistry - a common journey ahead” (DOI: 10.18331/BRJ2017.4.4.2) has been authored by Guest Editor; Professor Luigi Vaccaro (Università di Perugia, Italy). Luigi Vaccaro is a Professor of Organic Chemistry at the Universita degli Studi di Perugia (Italy) and is a Guest Professor (Bijzonder Gastdocent) at the University of KU Leuven (Belgium). Prof. Vaccaro is leading the Green S.O.C. group in Perugia and is dedicating his research and teaching activity to the development of sustainable tools for minimizing waste and accessing cleaner products. He is currently focusing on the identification and use of novel biomass-derived solvents and on the design and synthesis of novel polymeric matrices for the preparation of heterogeneous catalytic systems suitable for being used in flow and green reaction media. Recent applications are directed toward the definition of sustainable protocols for cross-coupling and C-H activation processes aimed at the clean synthesis of organic semiconductors and target materials. Luigi Vaccaro is author of ca. 130 scientific publications and received the Europa Medal from Society of Chemical Industry - London (2001), the ADP Award from Merck's Chemistry Council for "Creative work in organic chemistry" (2006 and 2007), the G. Ciamician Medal of the Societa Chimica Italiana (2007) and the Vigevani Visiting Professorship (2014). Luigi is an Associate Editor of the journals RSC Advances and Beilstein Journal of Organic Chemistry, and a member of the FWO WT&4 Chemistry expert panel and of the OECD-EPA commission on substitution of toxic substances. This must-read Editorial masterfully looks into the importance of incorporating the very principles of green chemistry in the field of biofuels production. The new issue also includes quality Original Research Articles and Review Articles. All articles published in the journal are freely available and are published completely free-of-charge. We look forward to welcoming you as an author. Biofuel Research Journal is now indexed by CAB Abstracts! A new phase of success: the 13th Issue of Biofuel Research Journal Released!